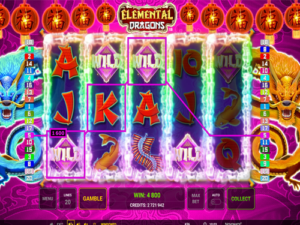 Elemental Dragons comes to Novomatic casinos just in time for Chinese New Year! This very special date is a very important one for the calendar! 2019 is the year of the pig. According to Chinese zodiac, people who are born in the year of the pig have amazing personalities and are generally lucky in life! Every year is represented by one of twelve animals in the Chinese Zodiac. These are: rat, snake, ox, sheep, tiger, horse, dog, monkey, rabbit, rooster, pig and the dragon! To celebrate the new year of a new animal, there are always big celebrations. The Chinese dragon features heavily in the celebrations, just like it does in this slot game! As the music plays, the dragons dance in the streets. Red Chinese lanterns are hung all over cities, towns and villages for the celebration. You can see a string of red lanterns at the top of this slot game. A blue dragon dances to the left of the reels and an orange dragon dances to the right. Legend has it that dancing dragons ward off evil spirits and bad luck. So, they might look terrifying, but they’re here to help you! Elemental Dragons has 5 reels and 20 paylines. While you’re spinning the reels of Elemental Dragons, you might be lucky enough to trigger a bonus or win some Free Spins. Book of Ra Deluxe is nice but This slot is pure celebration, all the way through! You’ll really have a good time playing this game, and you’ll feel like you’re celebrating Chinese New Year for real. Elemental Dragons has a stash of symbols that you’ll love! In true Novomatic fashion, the smallest payouts in the game are awarded for the card symbols. In this slot, these are: 10, J, Q, K and A. To get bigger payouts, look out for the lotus flower, the red lanterns, the gong, the koi fish and the firecrackers. The two dragon symbols award the biggest payouts in the game. These two dragons, along with the koi fish and the firecracker symbols, can get you wins for 2 or more well-placed matches. The rest of the symbols can get you wins for 3 or more well-placed matches. For the matches to give the win, they have to placed on adjacent reels and follow one or more paylines from the left. There are 20 paylines in total. Any gap in a payline can be filled in by the ‘Elemental Dragons’ logo symbol. This is a Wild symbol and also the Scatter symbol. Along with being able to substitute, it can also award its own wins for 3 of more matches, placed anywhere on the reels. There are 5 additional Wild symbols in this new Novomatic slot game! They each have their own special power. For example, the blue Wild symbol can randomly turn into the Scatter symbol. The green Wild symbol, on the other hand, is always stacked. There are two sticky Wilds (the red and the yellow ones) that will stay in place during re-spins. To get the Free Spins in Elemental Dragons, you need to spin the reels and have them stop with 3, 4 or 5 Scatter symbols in view. To begin with, you will be given 10 Free Spins but you can win more very easily! For instance, every time a Sticky Wild symbol lands on a golden reel, you will get an extra spin. When a reel turns multicoloured in the Free Spins, it can turn every single reel of the game into a Wild symbol. Then, the wins are really elemental and extremely big! Anyone who’s played Dragon Pays or Dancing Dragon and enjoyed them will love this new release from Novomatic!